After Sin City, I needed something a little bit lighter. So I opted for a classic, albeit one that skirts the rule on a film that skirts the rule on needing to be 80 minutes or longer. But our Fearless Leader has judged it to be okay, so I’m going with that! 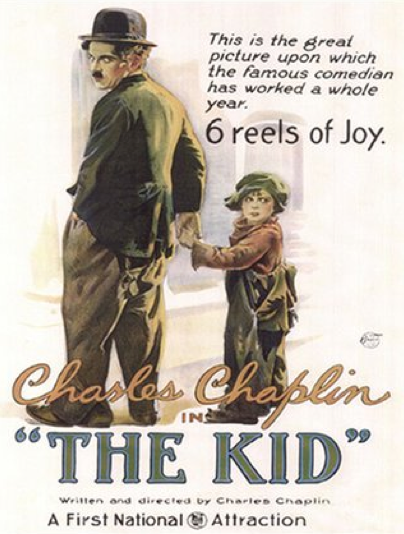 The gist: Charlie Chaplin plays a regular ol’ Tramp, poor but lovable. One day, he stumbles upon an abandoned baby in the street. He can’t really leave it alone, so he wanders around a bit looking for whoever lost it. Eventually, he realizes that he’s the only one the baby can really look to. So, reluctantly, he becomes the adopted father. Unbeknownst to the tramp, the Woman who is the baby’s mother still misses and loves her child. She realizes she made a big mistake in abandoning him, and reaches out to the poorest of the poor for years afterward. She crosses paths with her child, now grown into the Boy. He and the Tramp are grand old pals, doing small-time crimes and making pancakes. The Woman’s longing for her lost child grows, while simultaneously the Tramp and the Boy are separated by well-meaning law enforcement. But who really knows best for the Boy? Will he ever be reunited with the Tramp, the one who loves him most? What I “learned”: You really don’t need many elements to create a great story, but you do need room to make small moments count. The Tramp and the Boy are pals. That seems obvious, but it’s the small details that really show it. The scene where the Boy is making pancakes for the two of them is my favorite in the entire movie, just because of how intimate it seems. There’s love in their relationship, shown by how they pass the syrup back and forth and how the Tramp lets the Boy pray over his food even though he won’t (an allusion to real life?). It’s scenes like this that make the more dramatic ones make sense. I’m always one for cutting down fluff in movies, and this one has remarkably little. See this movie if you like: Movies that show fatherhood in a good light. I’m still surprised that there aren’t more films about being a dad, and everything that that entails. The Tramp starts out not wanting to be a father, but once he realizes that he’s all this young baby has, he’s all in. And while the world tells him that he’s an unfit father because he’s dirt poor, he and the Boy work and fight to stay together. Go dads! Avoid this movie if: Silent movies aren’t your cup of tea. Having said that, this story holds up amazingly well despite there being no spoken dialogue. It has its cheesy moments, such as a vision of a hand opening a book labeled REGRETS during a conversation between characters. But there’s enough physical comedy in the movie that non-film buffs should stay entertained. I certainly stayed captivated.